Welcome to all my new followers. Hello, I'm Stacey Maupin Torres a/k/a SM Maupin, born in Queens, NY, into a family of cooks, bakers and home economic teachers. Cooking, writing about cooking and talking about cooking are passions of mine that grow and grow each day. 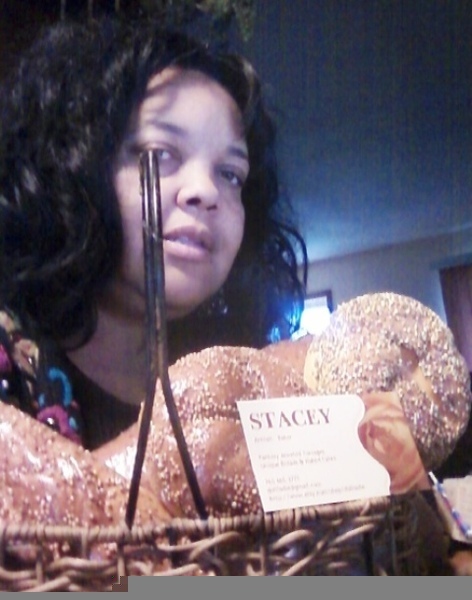 As caregiver to my mother, I have had more time to develop my skills, experiment with new and updated recipes and food ideas, and also launch my artisan bread business simply known as STACEY. I'm very glad to be here among such wonderful cooks and chefs. My ancestors - from the Caribbean, Africa, Ireland and points unknown -- I just know they cooked from the heart and its trickled down to me. Hi..I like your Spinach Casserole. It's great. I Stacey my name is Curt... I am Claudia's son ... nice to meet you!! Hey, Curt! Nice to meet you as well ... Your mom is one of my "Top Gir Chefs" ... Love Her! Looking forward to your recipes also! I like your recipes! We've gone through New Castle many times on our way back to L'ville! Thank you! Sorry I have not been on here much lately; illness in my family has kept me quiet. I'll have to check out your cookbook. Aren't they simply fun to write?! Thank you! Yes, it was both therapeutic/healing and FUN to write! I appreciate the supportive feedback. All the best! I'm so glad you liked my eggplant chili recipe. I really appreciate that your left a review. I just checked out your blog, and I love so many of your recipeslI can't wait to try the Zuchinni pie! I became your newest follower on CES and your blog. It was my pleasure, Judee. I sell my breads at our local farmers' market. Yesterday, a vendor was selling eggplant (fairly large) plants. I should have gotten a couple; will next week if she's there. Well, if not, I'll just be buying some eggplant - I love your recipe. Thanks for following, and I'll be doing the same. Nice to meet you! Glad to be part of these wonderful chefs & bakers. Thank you, Amos. I haven't posted anything new in a while, so I better get busy! Good luck with everything you are doing. 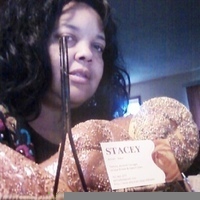 Hi Stacy I'm new on the site.i love Caribbean food. Do you have a recipe that is just to die for that is also pork free. Thank you for leaving a comment on Almond And Lemon Syrup Cake Recipe.I really appreciate it.Hope you will try it someday! Hi Stacey.Thank you so much for your nice comments for my profile picture.Looking forward to checking out your recipes! I am looking forward to trying your Bananas Foster cake. It sounds amazing! I (temporarily) broke the link to the book last week when I sold the last book from the first printing. The book was never meant to be published (long story), but I was encouraged to do so and was invited to do a book signing/cooking demo. I had a minimal amount printed by an on-demand printer just to see how it went. It went VERY well. So, I've placed a second order which I should receive in the middle of October. I will re-activate the listing at that time. Hope I have not posed any problems. I HAVE to remind myself to post that here. The proceeds from these initial printings will be used to take the book to a new publisher and go from there. Thanks so much, Stacey. Hi Stacey, I would love to read more about your cookbook, but the link to etsy on your profile seems to be broken! Good Morning, Laura. First, thank you for the "follow!" I (temporarily) broke the link to the book last week when I sold the last book from the first printing. The book was never meant to be published (long story), but I was encouraged to do so and was invited to do a book signing/cooking demo. I had a minimal amount printed by an on-demand printer just to see how it went. It went VERY well. So, I've placed a second order which I should receive in the middle of October. I will re-activate the listing at that time. Hope I have not posed any problems. I HAVE to remind myself to post that here. The proceeds from these initial printings will be used to take the book to a new publisher and go from there. Thanks so much, Stacey. Congrats on your book. You also resemble someone from the Hairlista site and if you are, here is another Lista sister jumping for joy at your success. Congrats on your cookbook how wonderful what a fabulous accomplishment! Thank you, Claudia - Actually, the book went on Kindle in January, but there were/are "issues" with the 'publisher' I used. Since then, I was asked to do a cooking demo & book signing at the City Market in Indianapolis. I was thrilled, til I remembered it's not in print ... LOL. So, I'm printing it myself (w/a very good printer); adding recipes & family photos, and will use that for signage now - using that revenue to have it published later. It's the story of my grandparents' journey from the West Indies to North America in the 20's, growing up with them, and my grandmother's recipes. Thanks for the frequent reviews and comments, Stacey. Congrats on the cookbook! Thank you for following, Jennifer - and for the kind words. Excited, I am! Now, to just get this book printed ... Have a great weekend. So cool about your cookbook! Congratulations! Thank you! I wrote it last year - it's a memoir about my family's journey from the Caribbean to America in the early 1920's, along with my grandmother's recipes. It was published in January as a Kindle (Amazon) book, but I've NEVER seen a dime from it, and the publisher and I are having communication "problems." Anyway, I'm self publishing on my own; having a printer willing to work w/me. This way, I can sell, generate some revenue - and then go to a larger publishing house later. Fingers & toes are crossed!